We, Vishwakala Machine Tools, established in the year 1967, are one of the leading Manufacturers and Exporters of a broad range of supreme quality Power Press & Shearing Machine. Our effective product range consists of Power Press Machine, Shearing Machine, Hydraulic Press Machine and many more. The best quality stainless steel and other basic materials are used for manufacturing of the power press & shearing machines. Due to its low power consumption, impeccable performance and longer operational life, the offered range of power press & shearing machines is highly appreciated. Offered range is easy to operate and requires minimum maintenance. It is used in various rubber industries, plastic industries, textile industries, machinery tools. With our eye for detail and constant innovation coupled with customer centric approach, we have been able to win a huge clientele across the world in such short period of time. For the purpose of increasing the productivity in the most efficient manner, the manufacturing unit is upgraded. a speedy and efficient transportation facility has helped us in winning the trust of our valuable customers in the most efficient manner. With our large production capacity, we have been able to manage bulk orders in the most efficient manner. Under the supervision of our executive manager, Mr. Amit C. Govindia, we have been able to a commendable position in this domain. With the experience of our executive manager, we have been able to win the trust of our valuable customers. 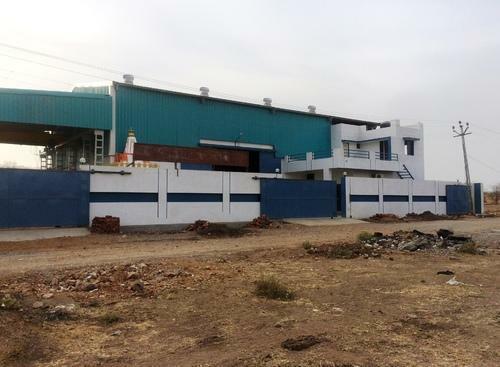 For manufacturing best quality power press & shearing machines, we have set up a huge infrastructure. We assure that the machines installed at our infrastructure are regularly serviced. In addition to this, the machines installed at our infrastructure are maintained, to enhance a defect free range. We have divided our infrastructure into several units. This division ensures that all the processes are carried out in the most streamlined manner. For increasing the productivity, we upgrade our infrastructure at regular intervals. 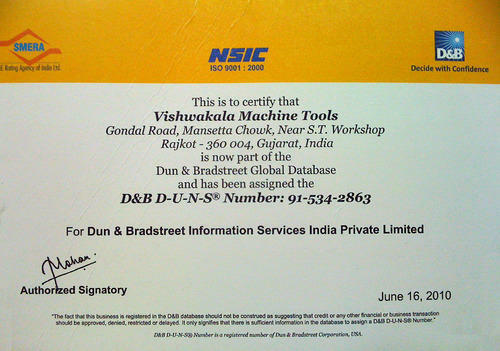 D & B Duns Number Registration Certificate. We at Vishwakala Machine Tools believe that our diligent workforce is the driving force that has lead to the path of success in such short period of time. Boasting of an extremely congenial work environment, our efficient professionals work for maximum customer satisfaction and delivery of the products with the assured time frame. Hold expertise in their area of operation, they are trained regular intervals of time, to enhance their technical and professionals skills in the most efficient manner. Backed with the knowledge and experience of our executive manager, Mr. Amit C. Govindia, we have helped us in gaining a commendable position in this domain. We have developed an efficient transportation facility that which helps us in delivering the offered range within the stipulated time at the customers’ end. Our customer centric approach and ability to meet the bulk orders, we have been able to win the trust of our clients. We have implemented complete transparency in all the business dealings, in a zest to attain total customer satisfaction. We have attained a commendable position in this domain, owing to our customer centric approach, ethical business dealings and ability to the mange the bulk demands in the most efficient manner. Prompt delivery has helped us in catering to the precise needs of our valuable customers in the most efficient manner. For timely delivery, we have set up a huge distribution network. Quality, being our utmost priority is maintained as per the international quality standards. In addition to this, we accept different modes of payment such as online, credit card and demand draft.